This size of the YardSaver Garden Shed range gives you a little more storage but still fits to limited spaces. 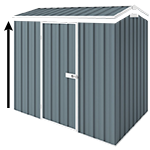 The YardSaver F54 Garden Shed gives you that much need storage but fits into limited spaces. The walls are 1.8m high and peaks at 2.025m at the gable height which makes it big enough to fit your mower, gardening gear, camping, biking and painting gear without overpowering your backyard. Thanks for very good service and I will certainly recommend your company to others. Well packaged, parts labelled clearly and great quality. When together its a very sturdy structure. The colorbond coating is all intacked and the best bit is the price. Delivered to a local warehouse hundreds cheaper than anything from bunnings or elsewere. I choose this shed because of its dimensions and not even custom could I get this shed for this price.